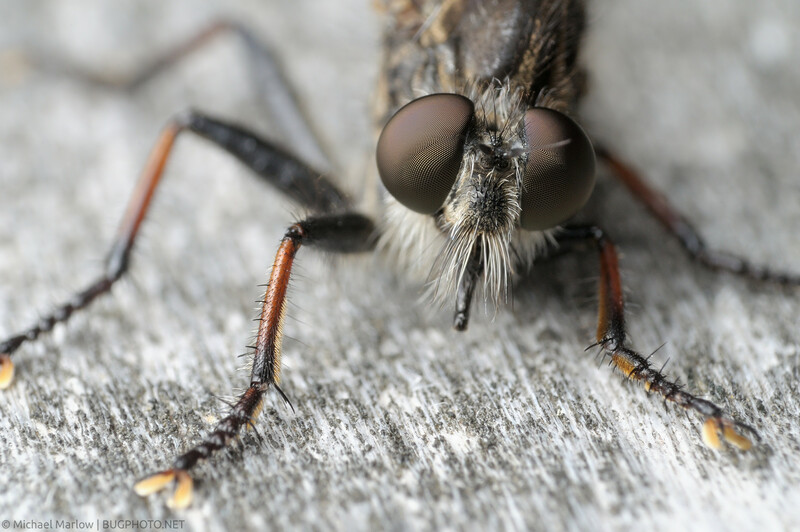 Robber flies, even the more commonly seen ones, like the Efferia sp. pictured, have seemed to elude me this summer. I have captured a few shots here and there, but I have not found a lot of willing subjects. This one was sitting on the fence and was cooperative for the most part (more on that below). I was pretty happy, and I had one of my more fulfilling days out shooting in a while. I even saw another less commonly seen (by me, anyway) robber — it’s a big one! I think a Diogmites sp. — though I was unable to get a shot. Still, it gave me a nice little boost. I also recently constructed a new flash diffuser and got a chance to test it out a little. I have discussed my previous DIY flash diffusers, and hopefully I will get a picture of this one up (one time I’ll take some pictures of the process of making it). Essentially it is the LordV Coke can design, but I added a third can for a bigger diameter. And so far so good! I think it’s working a little better than the smaller version, i.e. softer light. The only problem is, being larger, it is more unwieldy. This came into play with this robber fly because of the limitation of my flash bracket — I can only position the flash to the left of the camera. Consequently the position the fly took on the fence determined the difficulty or outright possibility of the shot. If it was facing left, I had to scrunch my diffuser (which I’m not quite willing to do yet); if it was facing right, it was very good for me. He was a bit of a flip-flopper, but not like anyone in Washington. Anyway, hopefully, I will get a (new) friction arm soon; that will help alleviate this problem and allow me to position my flash more properly. Posted in Robber FliesTagged Asilidae, DIY flash diffuser, Efferia, longtimenosee, Macro Photography, red, robber flyBookmark the permalink.